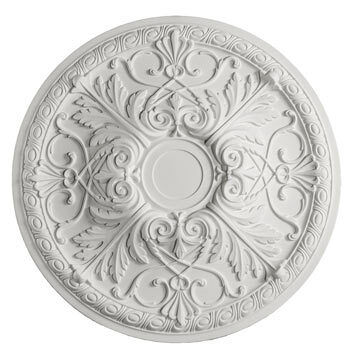 The MD-7060 Ceiling Medallion is 23-1/2" in diameter and has a depth of 3-1/8". 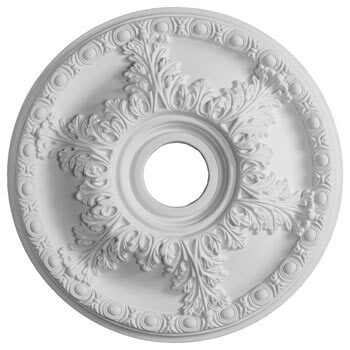 Ceiling medallions are the perfect finishing touch for your interior design project. 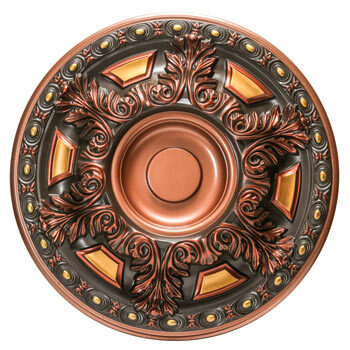 Use them to add luxury and charm to a ceiling fan or light fixture, or get creative and try them on walls for a pleasing, modern look that will impress all of your guests! Their innovative and lightweight design makes it easy to mount them to vertical surfaces. Some of our medallions come with pre-cut holes, while others do not. 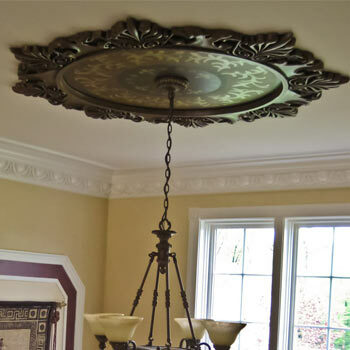 If you need a hole in your medallion to install with a fixture or fan, we'd be more than happy to drill it for you -- just select that option before adding the medallion to checkout. Or, if you'd prefer, you may drill the hole yourself. Polyurethane is durable and easy to work with, and you only need a hole large enough for the wiring of your fixture to fit through. We recommend using a generous amount of construction adhesive during installation and holding the medallion in place, momentarily, while the adhesive takes effect. Then, you can use low-tack painter's tape to continue holding the medallion in place while the adhesive dries. 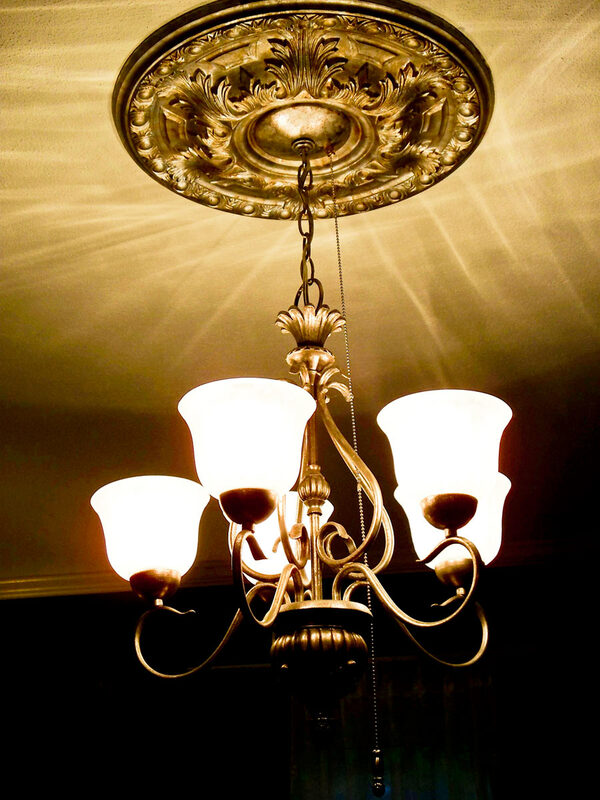 If you are installing the medallion with a ceiling fan, chandelier, or light, make sure the power is shut off at the breaker before attempting installation. Turning off the light switch only WILL NOT prevent you from being shocked. If you have any doubts or need further assistance, please consult an electrician. 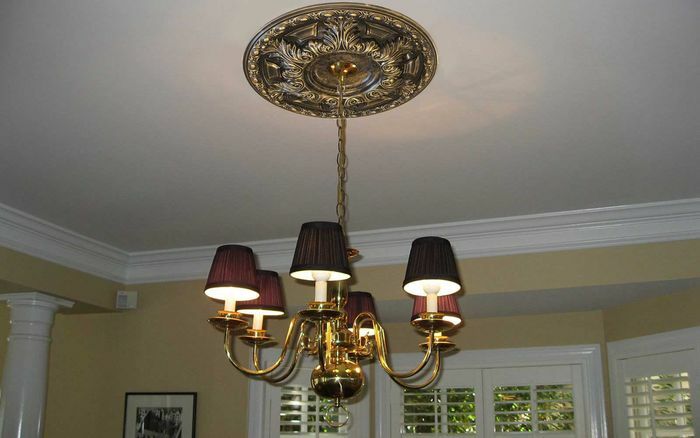 You may need longer bolts or a longer threaded tube than came with your fixture to accommodate the thickness of the medallion. You can get these at most local home improvement stores. 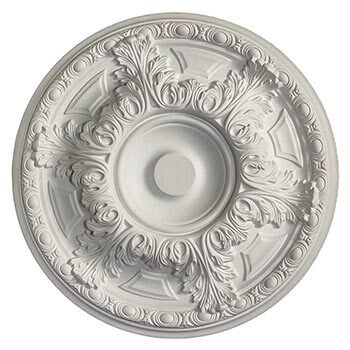 Many of our medallions have very intricate details and can be very difficult to finish once installed. 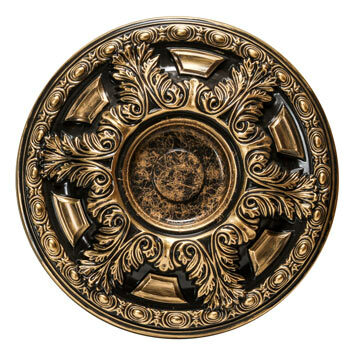 We recommend painting your medallion before installing it. A high-quality spray paint, Latex or faux finishes work great. You can then touch up any areas that need attention after the installation is complete. You can use any adhesive that is rated for use with polyurethane (check the back of the label) -- we have had great success using Red Devil Construction Adhesive, Loctiteï¿½s Powergrab and PL Premium Polyurethane Adhesive, all of which work well and are readily available at most home improvement stores. 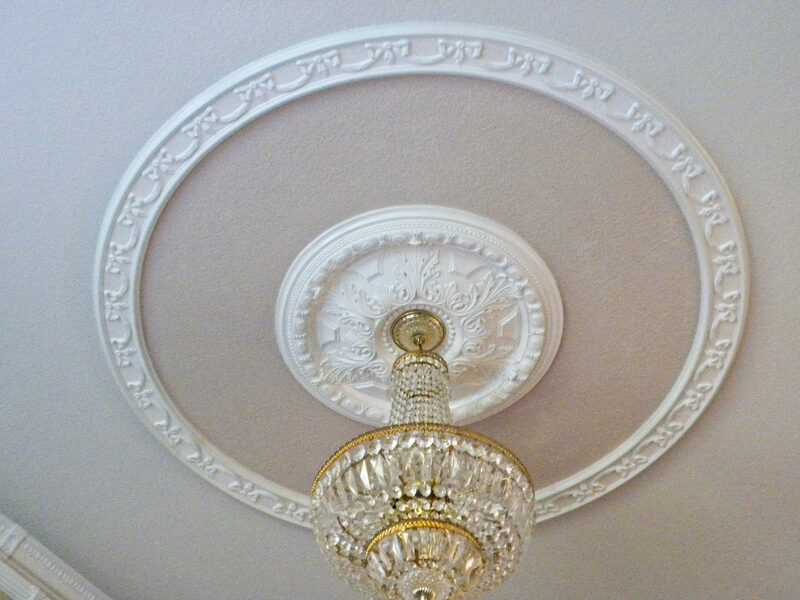 Run a 1/4" continuous bead of adhesive around the outer edge and randomly in other areas on the back of the ceiling medallion. Press the medallion up into place using a few finish nails or screws to secure the medallion while the adhesive dries. Once the medallion is in place you can caulk any holes and around the perimeter of the medallion using a paintable caulking. Touch up the paint if needed. 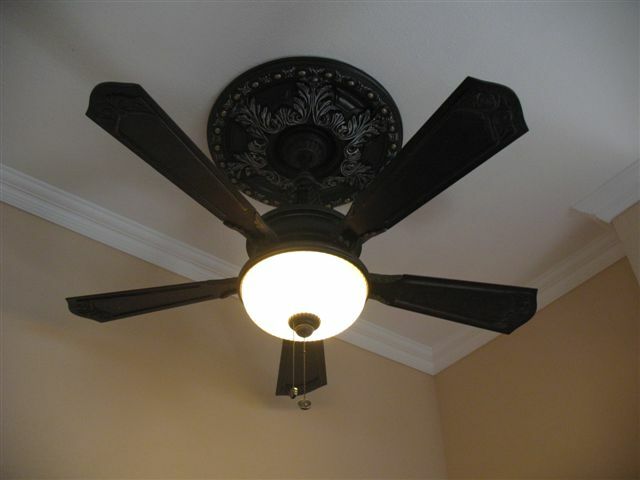 If you are installing the medallion with a ceiling fan, chandelier or light, make sure the power is shut off at the breaker before attempting installation. Turning off the light switch WILL NOT prevent you from being shocked. If you have any doubts call an electrician. 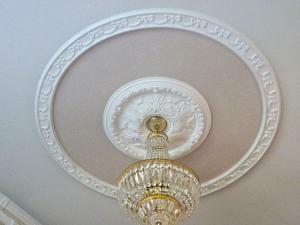 Medallions are for decorative purposes only and cannot support the weight of a fan or light fixture. 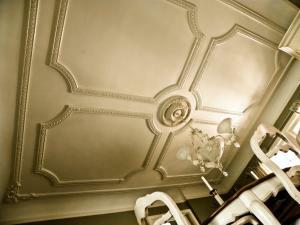 Your fixture must be supported by a support or junction box in the ceiling. Many of our medallions come with solid centers to allow you to cut the correct size hole for your application. 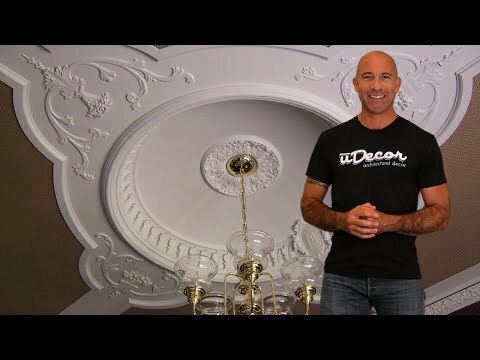 Take the bracket for your ceiling fan or light fixture and trace the area that you want to remove from the ceiling medallion. You will need a hole large enough for the wiring and holes for the bolts to pass through to affix your bracket to the junction box. The polyurethane material is easily cut so you can use a hole saw or a drill to punch out a hole. 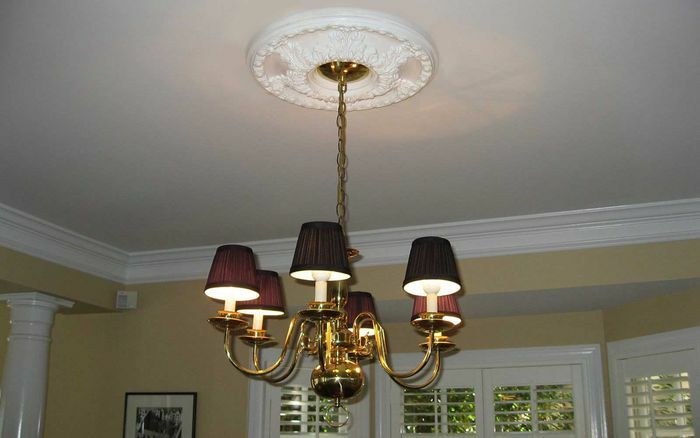 The hole doesn't have to be perfect since the fixture canopy will cover the hole. Dry fit your medallion in place on the ceiling to make sure all of the wiring and fixture parts will fit as planned. 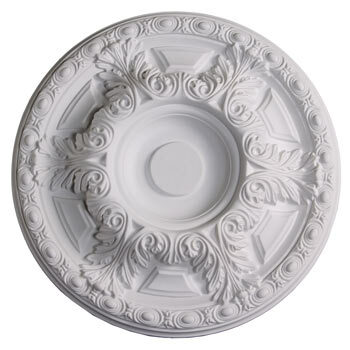 Run a 1/4" continuous bead of adhesive around the outer edge and randomly in other areas on the back of the ceiling medallion. Feed through all the wiring and then press the medallion up into place, using a few finish nails or screws to secure the medallion while the adhesive dries. Once the medallion is secure, attach your fixture bracket to the junction box. 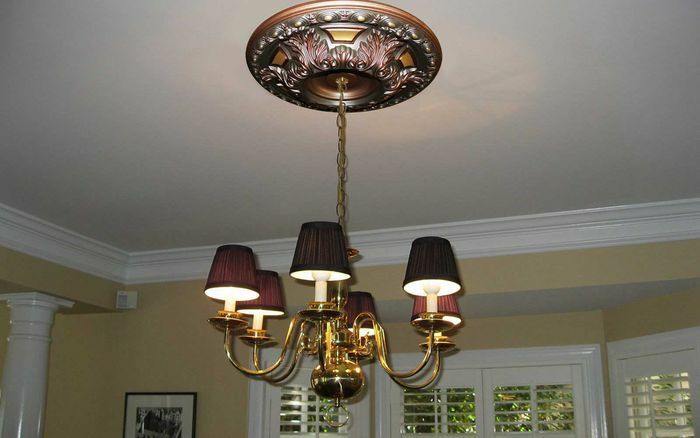 You may need longer bolts or a longer threaded tube that came with your fixture to accommodate the thickness of the medallion. Once the fixture bracket is in place, attach your ceiling fan or light fixture to the bracket and complete the wiring per your fixture's instructions. Once the wiring is complete slide the canopy into place to cover the hole of the medallion. Prior to doing the final finish work, turn on the breaker and test to make sure your fixture has been properly wired. Now that you have your medallion and fixture installed, caulk any holes and around the perimeter of the medallion using a paintable caulking. Touch up the paint if needed. This medallion is beautiful, well made and exceedingly elegant!!! This medallion is very versatile. 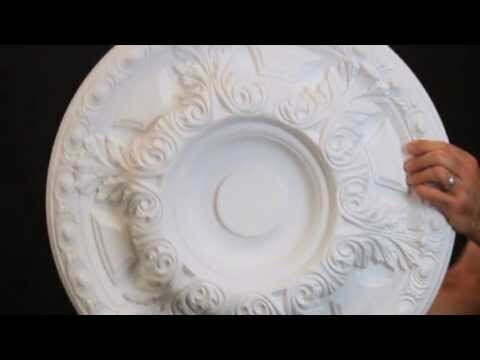 I work this medallion with acrylic paint and water. I loved it. This one looks good with the ceiling light. We had it put up with a new chandelier. It looks magnificant. I love my medallion! It is so beautiful and goes perfect with the chandelier. 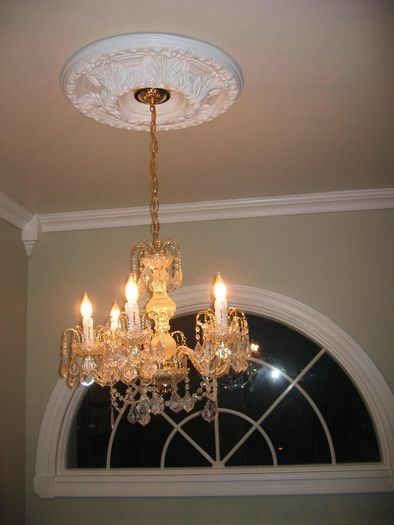 I will definitely purchase medallions for my other chandeliers.